Will Canadians See Pharmacare Started by 2020? by Trevor Zimmerman - pictured below speaking on pharmacare in Medicine Hat. Photo credit Jason Soklofske. 2020 is "the year we begin to see national pharmacare being implemented," said Liberal MP John Oliver to a recent iPoliticsLive luncheon panel. This is welcome news, but we still don't have a commitment from Prime Minister Justin Trudeau or any members of the federal Liberal cabinet. The campaign for pharmacare is far from over. Medicare as we know it was intended as only a start, to cover our most immediate needs like hospital visits and physician clinic visits. People like Tommy Douglas always understood that coverage for those areas alone would not be enough to meet our health needs, and so we must expand medicare to its second phase, which should include prescription drugs, among others. Canada is the only country in the world with a medicare system but no prescription drug coverage. And not surprisingly, we have the second highest drug costs in the OECD, behind only the USA. We can afford to do this. Political Economist Marc-Andre Gagnon has priced the cost for national pharmacare at $16 billion a year, while we currently spend $27.7 billion. This is a savings of $11 billion! Our patchwork of programs provide unequal coverage. Andre Picard has pointed out that a $20,000 out of hospital cancer drug treatment would be free for a patient in Nunavut, $3,000 in B.C., and the full $20,000 in P.E.I. This goes against the principles of Canadian medicare that treats us equally regardless of where we live. We need pharmacare to bring down costs, and to provide equal coverage for all, but we have to be clear about what exactly we want. Some politicians think out of pocket expenses should be part of pharmacare, but this goes against research showing prescribing fees even as low as $2 act as a barrier to people getting the medication they need. We see progress being made in Ontario, but we have concerns. The Ontario NDP proposed covering medication for everyone in Ontario, but only for a limited formulary of "essential medicines" - about 125 drugs. This would leave thousands of drugs still on the private market. The Ontario Liberals own proposal to begin in 2018 will have universal coverage of the full formulary, up to the age of 24, with seniors still covered. So medications for those 25-64 will still be subject to the private market. We would expect to see drug companies shift any cost savings under either the ONDP or OLP plan onto those who need drugs that still would not be covered. We have to ensure the national program we adopt is with no out of pocket expenses, and covers a full evidence informed formulary, so that no Canadian has to see medications as a luxury. Friends of Medicare are committed to a national pharmacare program, and if our federal government does not deliver, we believe Alberta can show leadership and adopt a provincial program here. We are joined in our national efforts by a range of supporters, from the Canadian Labour Congress (CLC), to the B.C. Chambers of Commerce, to the Federation of Canadian Municipalities who all support a national program. 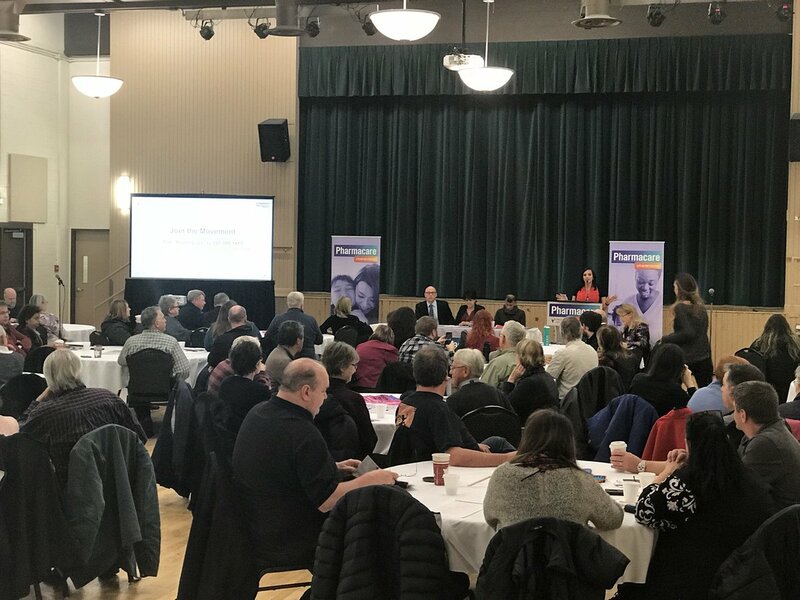 The CLC kicked off their national campaign on November 22 in Edmonton to a packed crowd (pictured below), and their efforts will be increasing in 2018. We believe the time is now to complete one of the unfinished areas of our public health system!